Parisa and Farid first met about 10 years ago when Farid was DJing. They went on a few dates but then moved on with their lives and decided to just stay friends. They saw each other from time to time and then they finally got back together again during a Persian New Years party in 2016. He asked her out and they officially started dating again. What began as a crush now means everything to them! Their wedding began with everyone getting ready at the hotel. 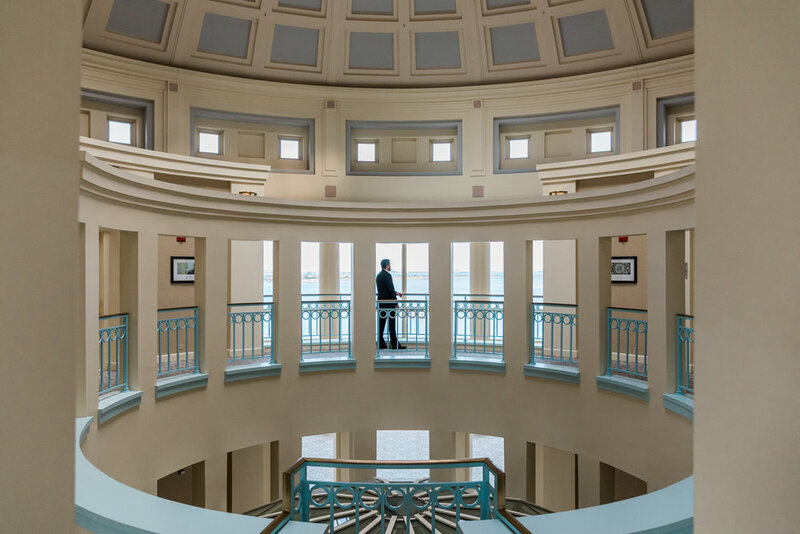 They had their first look on the rotunda overlooking the harbor and the street below. After a few photos under the arch, they began their ceremony around the beautiful sofreh. Persian ceremonies are a lot more interactive than western ones, where the audience cheers at different points, loved ones bring gifts to the table and the women closest to them rub sugar cones together over a cloth of unity to symbolize the sweetness of their marriage. The reception is where things really picked up. The toasts were especially memorable as there were many laughs and equal amounts of tears. The sheer love in the room was palpable. Once the dancing began, it didn't stop! Everyone - and I mean everyone was on the dance floor. Young or old, their family and friends sure know how to party! What an incredible night to remember and a huge congrats to the happy couple.